This very tall and slender apartment tower is a major addition to the midtown skyline as it is the tallest building close to the Empire State Building, four blocks to the south. 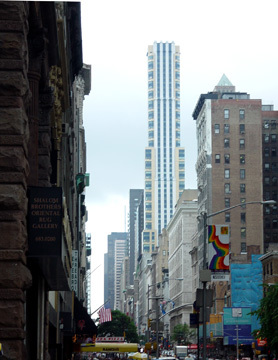 The striking 54-story building was developed by RFR/Davis and it was designed by Michael Graves, the architect best known for his very controversial and ultimately abandoned plans to enlarge the Whitney Museum on Madison Avenue at 75th Street. Michael Graves is one of the nation's most famous "post-modern" architects and his most famous buildings are a public building in Portland, Oregon, and the headquarters of the Humana Society. He also designed an interesting mixed-use tower for Sotheby's for its York Avenue and 72nd Street facility, but it was never built. His colorful architectural drawings are among the most prized and he has designed housewares. The development was designed initially in 1998 by Robert A. M. Stern in consultation with H. Thomas O'Hara Architects. Mr. Stern withdrew from the project, however, in 2001 and Mr. Graves took over the assignment. This 617-foot-high condominium tower was completed in 2004. It contains 81 condominium apartments on the top 27 floors, 16 floors of 94 extended stay furnished residences to be operated by the Envoy Club, four floors of office and professional spaces and two floors of retail. The slender tower has four setbacks and many apartments on higher floors have spectacular views and terraces. The building is across the avenue from Lord & Taylor, the famous department store. Two major computer stores are nearby and The New York Public Library and Bryant Park are two blocks to the north. There is good cross-town bus service on 34th and 42nd Streets but subways are not nearby. The building has a concierge and large windows, a two-floor health club with swimming pool, a business center, a children's playhouse, an entertainment lounge, a cinema room, a wine cellar and a private storage facility. The building has a plaza designed by landscape architect Thomas Balsey and an elliptical lobby with ebonized mahogany paneling. James Garner of The New York Sun said that this building and the Westin Hotel on West 42nd Street that had been designed by Arquitectonica were "among the ugliest our city has even seen," adding that they represented "a kind of mongrelized modernism - an arch allusion to that movement, with none of its tough integrity." While the pale yellow and beige palette of the tower was weak, Mr. Graves's design was an improvement over Mr. Stern's because Graves chose to emphasize its verticality with center white-colored piers while Stern's design had thin horizontal components that disrupted the verticality. Initial architectural resentment against the project also probably stemmed from its incursion into the long solitary precinct of the Empire State Building. Since its completion, however, several other tall towers have blossomed nearby to not only compete with this tower but also to lessen its impact on the skyline. While certainly not a masterpiece, it is not the clinker suggested by Gardner. For that matter, neither is the Westin. More importantly, the building heralded a rediscovery of the SoFi (South Fifth Avenue) area. This very tall apartment tower is a major addition to the midtown skyline as it is the tallest building to the north close to the Empire State Building, four blocks to the south. 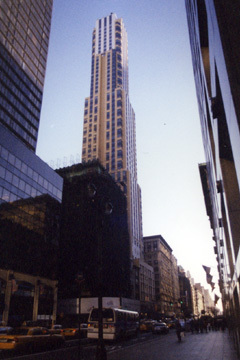 The striking 51-story building was developed by RFR/Davis and it was designed by Michael Graves, the architect best known for his very controversial and ultimately abandoned plans to enlarge the Whitney Museum on Madison Avenue at 75th Street. Michael Graves is one of the nation's most famous "post-modern" architects and his most famous buildings are a public building in Portland, Oregon, and the headquarters of the Humana Society. He also designed an interesting mixed-use tower for Sotheby's for its York Avenue and 72nd Street facility, but it was never built. His colorful architectural drawings are among the most prized and he has designed housewares. This condominium tower was completed in 2003. It hasl contain 81 condominium apartments on the top 27 floors, 16 floors of extended stay residences to be operated by the Envoy Club, four floors of office and professional spaces and two floors of retail. The slender tower will have four setbacks and many apartments on higher floors will have spectacular views. The building is across the avenue from Lord & Taylor, the famous department store. Two major computer stores are nearby and The New York Public Library and Bryant Park are two blocks to the north. There is good cross-town bus service on 34th and 42nd Streets but subways are not nearby. The building will have a concierge and large windows, a two-floor health club with swimming pool, a business center, a children's playhouse, an entertainment lounge, a cinema room, wine cellar and a private storage facility. The building has a mid-block plaza on the side-street designed by landscape architect Thomas Balsey and an elliptical lobby with ebonized mahogany paneling.